In this month’s noise of food and more food, though, the art on the walls at Creativity Explored reminded me of two vital gifts, the same forces that pushed me into my own work and that inspire me still after all these years. One, the power of unleashed creativity and uncensored expression to reveal who we are as individuals. And two, the power of people coming together to support each other and help each other thrive. 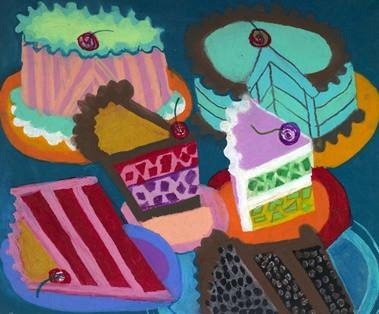 Camille Holvoet, one of the studio artists at Creativity Explored, is known for her rich, lush oil pastels of cakes, pies and pastries. If you haven’t visited the exhibit yet, please try to carve some time out of these waning weeks of summer to stop by and see the works. Be sure to linger at Steven Greeter’s Popsicles, Kevin Roach’s interpretation of meat in Pork Cut Chart, the vivid montage of green in Peter Cordova’s papier mache Vegetable Bowl, John Patrick McKenzie’s hand-lettered Tablecloth, Betty Benard’s Watermeloncollage, and Camille Holvoet’s many cupcakes. They are truly stunning, and while I may be biased about the provocative images (yes, a few of those red dots marking sold paintings and sculptures are mine), I also believe Creatively Explored to be one of the most important nonprofits in the Bay Area. Their mission, to support the creative efforts of developmentally disabled adults, has been realized through an ambitious vision pushed forward with much hard work. In addition to offering a safe studio space and workshops for their artists, they promote their artists’ works at their Valencia Street gallery and in museum exhibits around the world. Like many mainstream, for-profit galleries, half of the money received from buyers goes directly to the artist. I’d been lucky enough to help teach a workshop earlier this summer at their studio with Sharon Smith, one of many instructors who teach there and a friend who nurses her own personal mission to show the artists how to eat more healthfully. Wanting to offer easy, nutritious and delicious alternatives to the daily snack truck that arrives everyday at the studio, Sharon had asked me to assist her with transforming whole fruit into edible art. 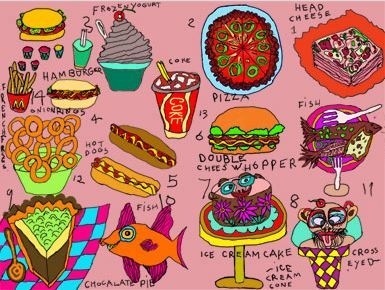 FAVORITE FOODS, by Camille Holvoet, 2007. It was new territory for Creativity Explored. A hands-on cooking class had never been on their list of objectives, but with some dedicated fundraising through Sharon’s contacts with the food industry and lots of paring knives, we were able to come up with four tables worth of colorful, edible art. After the artists had a chance to sketch the fruit whole, we all worked together to prepare platters of rainbow-bright snack skewers. Melon-ballers helped us transform large, unwieldy, intimidating orbs into small, friendly finger-food. Oranges kept their peels, as color and convenience dictated the results as much as flavor, while five different hues of apples fueled debates on everyone’s preferences for sweet vs. tart. To my delight, I noticed that both green and red grapes managed to travel more directly to mouths than skewers. The patterns, shapes, textures and rhythms that emerged on each artist’s skewer informed a second wave of sketches. Along the way, we all shared stories about our favorite fruit. The recipe for the day was a dessert dip made with three ingredients: yogurt, honey and orange juice mixed to taste (lots of tasting!) and poured into a colorful bowl. It doesn’t get much easier than that. It’s a challenge for all of us to eat healthfully but especially so for adults of diverse development levels who may not have full kitchens, basic cooking skills, steady incomes or an attentive family. 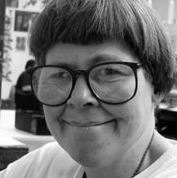 Thanks to Sharon, though, Creativity Explored has an instructor as dedicated to their artists’ physical health as their creative spirit. 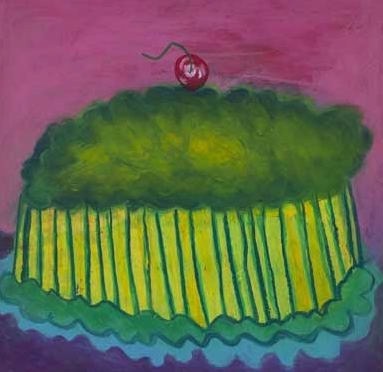 CAKES by Camille Holvoet, 2008.